Dan Hegarty in action at the Macau Grand Prix. The rider killed in a crash at the Macau Grand Prix today has officially been named as English competitor Dan Hegarty. The 31-year-old from Nottingham came off the Top Gun Racing Honda at Fisherman’s Bend. The race was immediately red-flagged. Dan Hegarty has sadly been killed following a crash at the Macau Grand Prix. A statement from the organisers said: “Daniel’s family and team have been contacted, and the Committee will ensure every assistance is extended to them. Mr Hegarty made his debut at the famous Chinese road race in 2016, finishing in 16th place. He was the Isle of Man TT Privateers Champion in 2016 and had raced at the TT since 2011. Mr Hegarty's fatal accident was the first at Macau since Luis Carreira from Portugal was killed in qualifying in 2012. 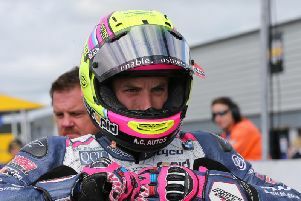 It is the second tragedy to hit the Top Gun Racing team this year after Gavin Lupton died following a crash at the Ulster Grand Prix in August.